What kind of condition is your air conditioning in? Noisy? Uneven? If your old system just doesn't make you feel the way you used to, we can help. Over 100 years after developing the world's first modern air conditioner, our products continue to rank among the world's best. 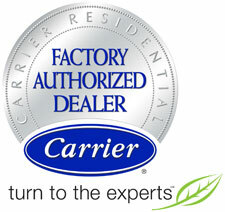 Willis Carrier invented the first modern Air Conditioning System in 1902 and Carrier has been perfecting his idea ever since. See for yourself why this system is so sought after. Refreshingly energy efficient, quiet and durable, our air conditioning systems are meticulously designed to keep you cool as a proverbial cucumber. Another way to beat the heat—and your energy bills—is with one of our heat pumps. That's right: We said heat pumps. They're central air conditioners with the added benefit of being able to heat your whole home for much of the heating season. From our economical Carrier Comfort Series to the famed Infinity Series Air Conditioners to our Ductless Systems, you can rest assured you are receiving reliability, efficiency and quiet running units (Decibel ratings between 56 – 76) for total home comfort. With SEER ratings all the way up to 21, these units will cover all your needs. Round off your system with the innovative Infinity Touchpad Smartphone enabled control for your highest degree of comfort management. Have a brand new project, home or building? We can assist you in designing the perfect system to meet or exceed your needs ensuring long term success. Throw in a comprehensive service/maintenance plan for added cost savings and on-going peace of mind.